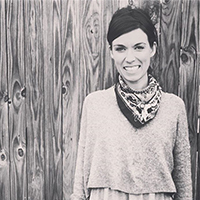 Ashley Addair is a visual artist, mama of three, and collector of chairs. She is a modern dancer and holds track and field records in the state of Illinois. She tells on joke every year at Christmas. If she weren't a painter she would be a scientist. Her chief interest is in color and it's use as a metaphor for being. Addair is an active member of her arts community in Knoxville, Tennessee and her paintings are collected internationally. Artist Statement: Through painting this body of work I’ve learned that the Self is an integration of our ancestry, as well as the acknowledgement and validation that we are a paradox. Imagery is sourced from family photographs. The materiality of the paint, the colors and patterns, marry the material world with the spiritual world, capturing the complexities of time, people, and emotion on the canvas. The nature of the paint, and the medley of implementation, act as conduits for the past to live in the present, mirroring the ancestry of our lives. The small paintings, with their Polaroid frame, recall old family photographs, and firmly migrate the notion of Art from something noble to something common—and this represents an idea of femininity, that the nobility of expression is pleased to inhabit a person often limited by society.